“Afraid of the dentist? (You’re darn right I was!) It was right up there with flying a twin-engine airplane with one engine out and the other one sputtering. The idea of sitting in a dental chair with some doctor cramming a jackhammer down my throat and trying to convince me it was a dental tool wasn’t my idea of a good time. “You have no idea of the things I’ve done to help me break dental appointments. Once I called the dental office and told them that I couldn’t came in because my uncle was going to marry his widow’s sister. The receptionist quickly replied, ‘That couldn’t be true, dear. If he has a widow, he has to be dead.’ (Oh well, it was a good try). “Needless to say, I was running out of reasons, and I had a hummer of a toothache. “Arriving at a local clinic, I noticed that there was a dental office right inside the main entrance. As I reached for the doorknob, I noticed that there was a sign that read ‘Dr.Odegard – 2nd floor.’ He obviously would be a better choice because I could take the stairs and it would take longer to get there. (Anything to prolong the inevitable!) As I entered the stairwell, I took one step up and two back down and before I knew it, I was back in the parking lot deciding to chuck the whole idea. Then it hit me — I’d always wanted to be an Olympic athlete. I quickly re-entered the clinic and proudly climbed the stairs, pretending at the top I would have the honor of lighting the Olympic Torch. Finally arriving at the second floor, I took a deep breath, opened the office door, went in, and promptly burst into hysterical sobbing. Before I knew it, everyone was telling me it was okay. They sat me down and talked to me about everything but teeth, and before I knew it, my aching tooth was repaired. That was four years ago, and I don’t worry about dental appointments anymore. 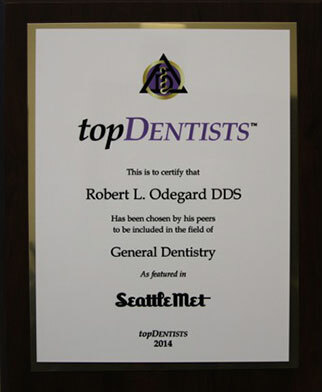 Dr. Odegard (Dr. O as I call him) and his staff are the best. They strive for patient satisfaction, and demand excellence, and their patients become family. We have shared pool parties, Mariners tickets, and constantly keep each other laughing. Dr. Odegard and Crystal did a unbelievably fantastic job on my composite filling. The color match is perfect and composite so smooth you can't even tell I've had any work done. I'll no longer be self conscious about the spot on my tooth!! “Thank you SO much for doing such a FABULOUS job fixing my front teeth — they look and feel AMAZING!!!! I’ve been showing them off all day around the office!!! “I think there is a reason for everything to work out the way it does. It was meant to be that my coworker was out of town last month and I ended up talking with you that Friday in her absence, and then my other coworker Katie saw your name on my screen that day and RAVED about how awesome you are as both a dentist and a person. I instantly got that feeling that day that I should go see you. I’m so glad I did! “The fact is that I’ve been walking around with a chipped tooth for months and it’s been killing me to see it in the mirror every day. My excuse was always that I was too busy, but now I know the real reason why I was delaying it: deep down I didn’t feel confident about going back to my previous dentist for a fix. The best dental experience I’ve had! “I’m not sure if you remember us, but both my husband, Luke, and I were patients of yours when we lived in Renton from 1999 to 2004. We moved back to the East Coast to be closer to family, which has been great for all of us. “One of the unfortunate matters we had to deal with our move was trying to find new doctors and dentists. After trying several out, we finally found a family dentist in the area who we really like. I have to tell you, though, that every time we went to a new dentist, they ALL remarked how amazing our dental work was: dental work that you did. I think we went to three or four different dentists and they all commented on your excellent work. Every single dentist. Even today, while I was getting my teeth cleaned, my dentist asked again about you and let me know that most dentists wouldn’t bother with the detail and precision you used with my porcelain crowns. I was thinking that it was important you know how impressed all of these dentists are with your work. “When I arrived at Dr. Odegard’s office about five years ago I thought it was going to be a routine office visit. Much to my surprise, it turned into a five-year dentist/patient bonding experience due to the extremely poor care I had obtained from my past dentist. Every step of the way, Dr. Odegard explained in detail the process and methodically handled every problem I had, which was extensive. “At 50-plus years old, I had my teeth for all of my life. They were not straight. They were not bright. So I went through orthodontics to make them straight but they still were not bright. Many years of coffee and tobacco had taken their toll and what I now wanted was a healthy, gleaming smile.